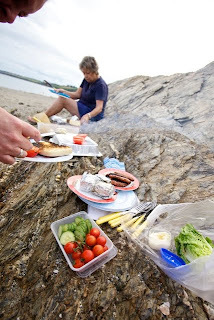 There is nothing like a barbecue really, and I know I have harped on a few times about them but they are always different, easy and sociable. We have spent the last week in Cornwall staying with my Dad. The weather has been rubbish and I have not been too much on the healthy side, but we did manage to get to the beach for a barbecue. And a swim! Homemade burgers, good sausages, big beef tomatoes that have been seasoned well and a glass of cold white is certainly delicious. Even Harley partook in some Freixenet. It was fortuitous that my step-mum had forgotten the wine. This meant a little jaunt to to Veryan and found a fab little village shop with quaffable chilled wine. We certainly were keeping a British stiff upper lip as it was not warm August weather but the chocolate brownie we ate afterwards made up for it! Melt 2 bars of Green and Blacks 70% chocolate with 150g butter. Whisk in 2 eggs along with 250g demerera sugar. Next mix in 125g self raising flour until everything is well combined then pour into a greased 22cm square tin. Experiment with scatterings of white chocolate chunks, pecan nuts or marshmallows. Leaving plain is good too, then bake at 180C for 15 minutes.